Yes, We Change Golfer Spikes on Shoes! Changing the spikes on your golf shoes can enable you to gain traction and stability in your swing. Avid golfers change the spikes on their shoes two or three times a season. The average golfer should at least replace them once a season. However, if you have ever attempted to replace the worn-out or broken spikes on the bottom of your golf shoes – you’re certainly aware of the time and aggravation the task can entail. It is anything, but a simple quick job. The plastic cleats of today can become entrenched with dirt, grass, pebbles, and other little particles that can make it much more difficult to do it yourself. Removing the old spikes can be painstaking, while adding the new spikes is fairly easy. First, you need the tool, which costs $15.95 + tax. Second, what type of spikes are on your shoes? Each manuf acturer of golf shoes uses a variety of different types of spikes. Third, not all of these spikes have the same connector to adhere them to the underside of the shoes. there are more than a dozen types of spikes in the marketplace and three major types of connectors: Fast Twist, Q-Lok, and Pins. Lastly, buy a set of new spikes for your shoes with the wrong connector, and you are off to the store again to exchange them as they will not fit. Typically, replacement sets of spikes run between $10.95 and $18.95. Add that price to the cost of the tool and your expenses are near $35.00 before the tedious labor to install them. 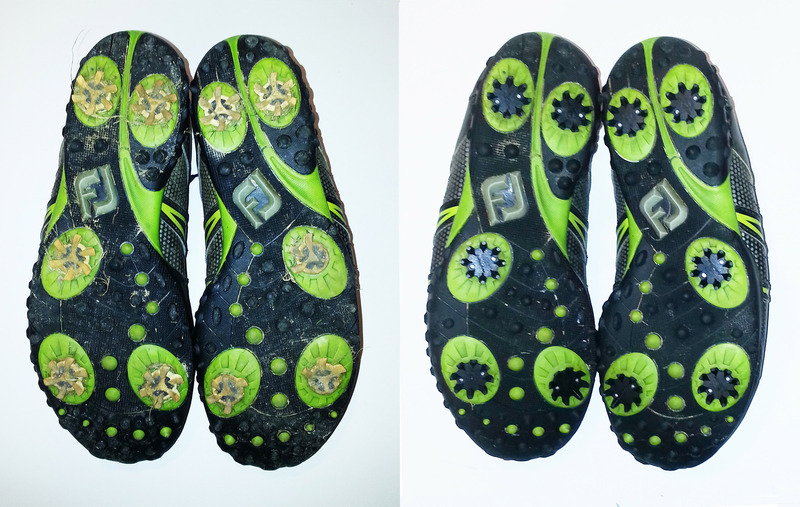 At Better Golf Shot, we have changed hundreds of pairs of spikes to date. We stock multiple spike types for each different connector. We’ve developed a few tricks to get the old spikes removed, but it still can take us upwards of an hour in some cases even with our shoe changing station. Better Golf Shot also offers some lower priced spikes as well, since we buy from multiple sources. Your average sporting goods store only offers the higher-priced (higher margin) models. Our price to change a set of golf spikes is $30.00, which includes the cost of the spikes.